Life of Libby | Travel & Lifestyle: 20 Incredible Places To See In Prague! Quite possibly the most well known landmark in Prague is Charles Bridge. This stone bridge has 30 statues on it and is incredibly impressive. However be prepared to fight through the crowds as hundreds of visitors flock here each day. If you fancy the bridge almost to yourself you'll need to head here bright and early, and I'm talking 7am early. The Powder Tower was the first of four towers we visited during our stay in Prague. It's right next to the Municipal House but you can't miss it. 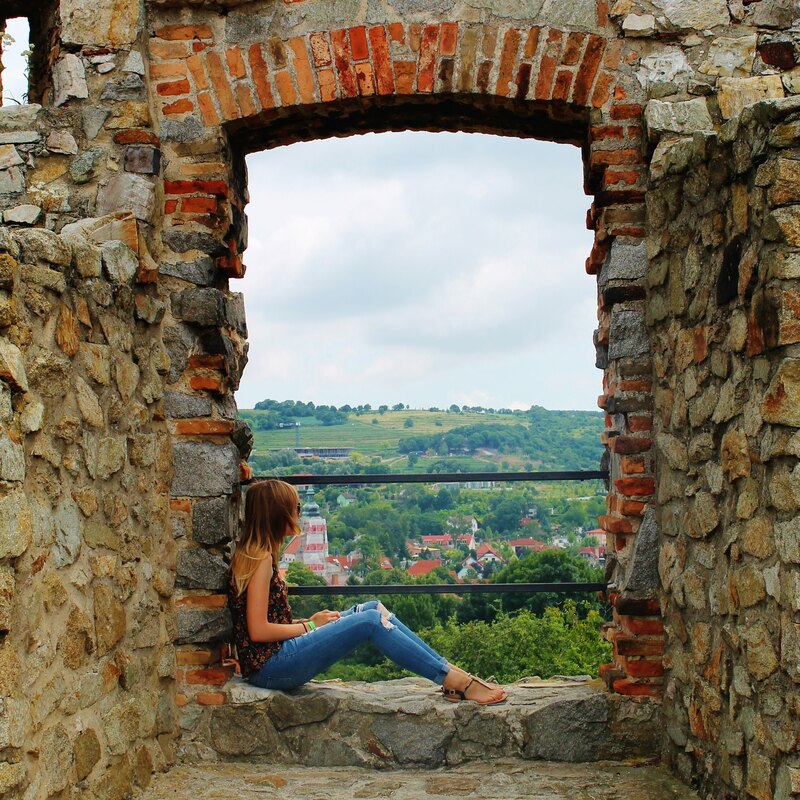 It was once used as a city gate, but today is used as an observation tower for visitors to get an amazing view of the city. Located near the Museum of Communism you will find a wall of painted bricks known as the Beneficial Bricks. This is a fundraiser to help mentally handicapped people, as you can donate money to paint your very own brick. Or perhaps more than one! Many people painted their national flag, or an inspirational quote, and all together they look incredible. The main square in the Old Town is where many of the famous landmarks of Prague are located. It's a great place to wander around, but can definitely get busy! Crowds of people gather here on the hour to watch the clock's 'show', but what's more amusing than watching the clock is watching the crowds instead. So many people were in awe of it! It's mounted on one of the walls of the Old Town Hall. Next to the Old Town Square is this amazing Gothic church. It towers above all of the buildings and is so impressive! 7) Eat 'Chimney' Cake Filled With Ice Cream! Head to Good Food Coffee + Bakery and try a chimney cake. Similar to a crispy doughnut / sweet pastry, no words can describe how good they actually taste. You can have the cone filled with a variety of flavours, such as soft chocolate ice cream or strawberries & whipped cream. Whatever you have, I guarantee it will be delicious and you'll be wanting more than just one throughout your trip. The Old Town Bridge Tower was the second tower that I visited whilst I was in Prague, and is located at the end of Charles Bridge nearest the Old Town. It's a great tower to head up for a view of the bridge and the river, as well as the Old Town. This cafe is located close to the Old Town and is the perfect place for any chocolate lover! They make one of the best hot chocolates I've ever had, and I don't throw such an award around lightly... they're so thick the consistency is like melted chocolate! If you have an hour to spare during your visit, take a river boat tour for a different view of the city. On the other side of the river you can find the Lesser Town Bridge Tower near Charles Bridge. The reason we visited so many viewing towers is because you can buy a combined ticket for four towers. It turned out to be an incredible way to see the city and I would highly recommend. Near to Kampa Island is a graffiti covered wall inspired by John Lennon. The wall has been full of inspirational quotes and political messages since the 80's and shouldn't be missed. Prague Castle is a castle complex made up of several well-known buildings in Prague, and is one of the most popular areas for tourists to visit besides Charles Bridge. The complex is a lovely area to walk around, but the castle itself isn't that impressive compared to other European castles. Visitors can purchase a ticket that allows entry into several of the buildings. One of the main buildings inside the Prague Castle complex is the Basilica of Saint George. It's almost easy to miss next to the impressive St. Vitus Cathedral, but is still a quaint little church. 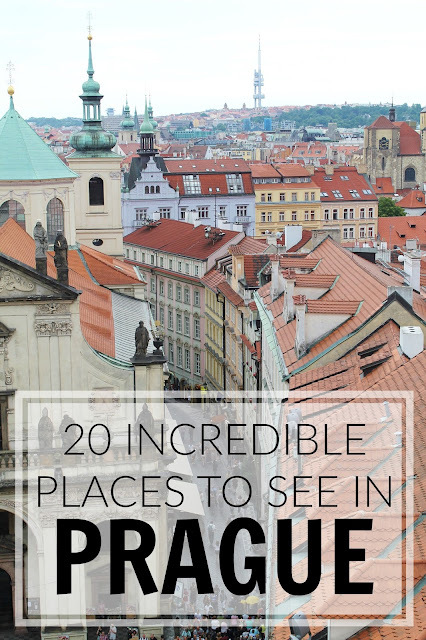 You can't miss St. Vitus Cathedral as it towers above all of the other buildings in Prague. Arguably the most impressive landmark in the Prague Castle complex, if you think it looks incredible from across the river, just wait until you get up close to it! Another attraction inside the castle complex is a lane of miniature dwarf houses. They are so cute! The fourth observation deck within our combined tower ticket is at the top of St. Nicholas Church. I'd recommend going here to watch the sun set. Head to Petrin Hill by either walking up or taking the funicular. At the top you will find Petrin Tower, a cast iron viewing tower in a similar style to the Eiffel Tower. Although not quite as impressive, the observation desk still gives amazing views of the entire city. Take a walk from Charles Bridge along the bank of the River Vltava to the Prague Dancing House. It's one of the most unique pieces of architecture I've ever seen! Although Prague isn't known for its street art, this huge piece outside of the city centre in the district 6 was very cool!